Commemorate loved ones who have passed away with a respectful flower arrangement that honors their life. This beautiful and sympathetic flower arrangement includes mini pink carnations and baby's breath. 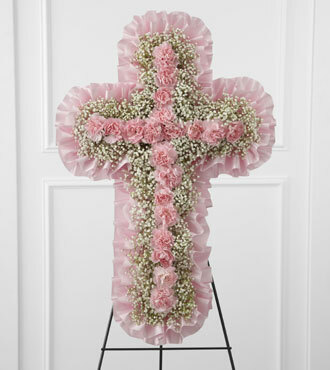 The flowers are arranged in the shape of a cross and tied together with a beautiful pink satin ribbon that runs along the perimeter of the arrangement. You can commemorate the life of someone important with this flower arrangement that is carefully fixed to a display easel.